If David Lynch did Finland . . . A highly contagious book virus, a cult literary society and a world-famous, disappearing author, set in a distinctly Twin Peaks-like atmosphere . . . Welcome to aSteampunk wild west starring Doc Holliday, with zombies, dinosaurs, robots, and cowboys. Thirty-three science fiction, fantasy, and horror short stories grab readers by their emotional cores to star deep into the source of our humanity and inhumanity . . . sketch surreal pasts, presents, and futures full of characters with familiar and outsized desires and fears. 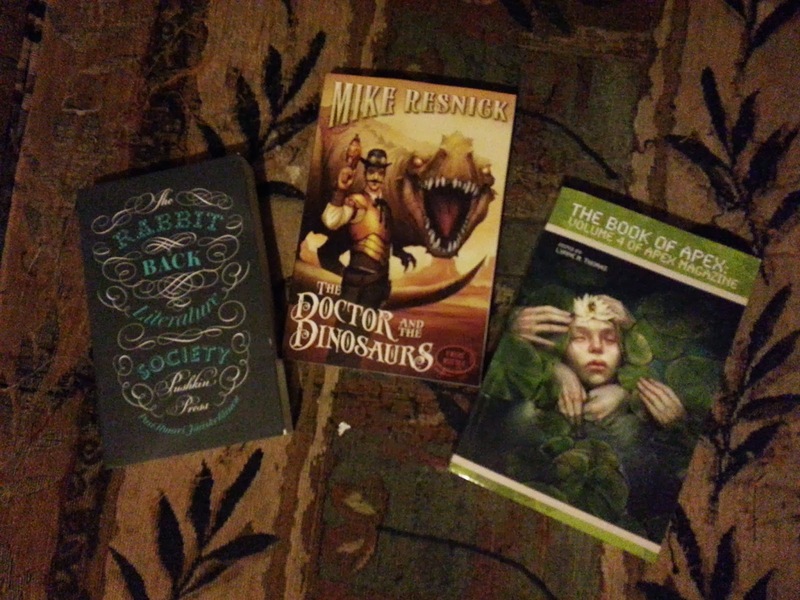 dinosaurs fiction sci-fi Stacking The Shelves western What Are You Reading? Ooh nice! These are new to me! Hope you enjoy them all! Nice! I got two this week. I think the one I'd be most excited about is The Rabbit Back Literature Society. Happy reading! These are a little different from what I've been seeing- The Rabbit Back Literature Society looks fascinating. The whole Twin-Peaks thing is a great hook but that probably dates me. I like to browse and flip through a short story collection, so I'm quite happy to have Apex in paperback. The Doctor and the Dinosaurs looks awesome! So you've read another book then? I am so curious I will have to check it out. I am seriously looking forward to that Apex book! Yeah that one just hit all the right buttons for me. I haven't heard of The Rabbit Back Literature Society, but what a great cover and blurb. Hope you enjoy! ENJOY your books. Again...I don't know any of these books. Most likely because I don't read this genre. "If David Lynch did Finland . . ." and "Doc Holliday, with zombies, dinosaurs, robots". Wow, this sounds like some fun reading!